My customers have been asking me for years how they should clean their Onefooters, so I set out on a search over the past year and a half to try and find the exact right formula. I tried a number of them, and I have finally found the one I am happy to pass along to you! The Onefooter rings in silver, set with coloured precious and semi-precious gems, are very popular. Their only drawback is – they are silver! And silver reacts with the chemicals in skin and air – it tarnishes, it just does. You have probably heard of some jewellery cleaning tricks over the years … from toothpaste and vinegar to Mr. Clean, bleach and boiling water with aluminum, most of these suggestions are either dangerous for your jewellery, or your health (or both), or just not effective. Personally, I have found some commercially available silver jewellery dips just too harsh – they change the surface of the metal, I just don’t like it. I once was mailed a ring which a client had left in such a solution for a couple of hours … it wasn’t pretty – the silver had basically been eaten. Plus they smell awful. So I am delighted to offer this middle way: it IS a dip, but an extremely gentle one. This means you will still need to apply a bit of ‘mechanics’ to get your jewellery shiny as new (utilizing the included brush, and afterwards the polishing cloth). I have decided that this is what I am happy to offer to my clients. 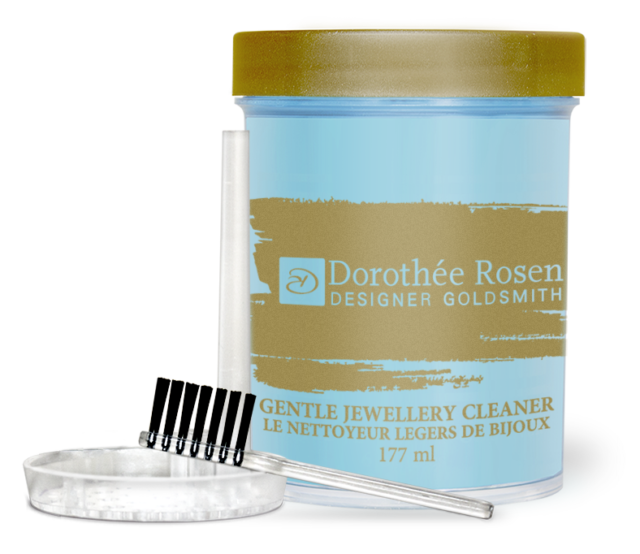 This ammonia-free cleaner is especially formulated to clean gold and silver jewellery, including all types of delicate and porous gemstones (and even pearls and opals). So it’s perfect for the Onefooter Series, including the ones with stones. It is an effective, surfactant-based formula, especially designed for delicate pieces. Unlike other jewellery ‘dips’, ours has a gentle gardenia scent. A dipping basket and touch-up brush are included in your kit. The jar is clear, so that you can see your piece while it’s in the liquid. The basket makes it easy to lift it back out. Yup – I really really thought about this a lot, and tried all kinds of things before I settled on this combination: clear jar, basket, brush, cloth, and a golden box to pack it all away in*. This kit also contains a polishing cloth, which is designed to clean and polish the finest gold, silver and platinum jewellery. 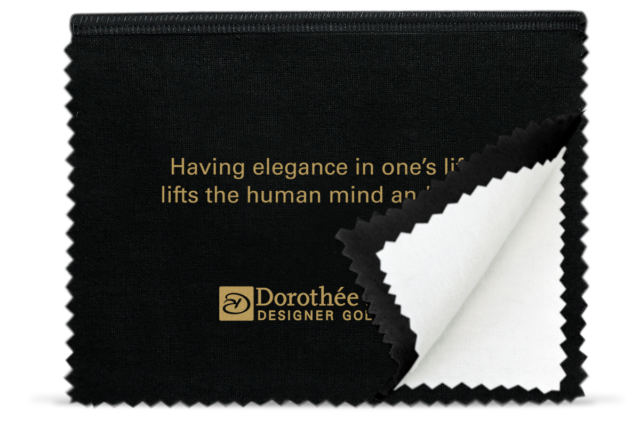 The non-rouge inner cloth is treated with a trade-secret formula to remove any leftover tarnish and discolouration, and to restore lustre without scratching or removing the finish. Finally, buffing with the 100 percent cotton outer cloth provides a gleaming lustre. So how exactly do you do it? First, you immerse your Onefooter in our cleanser for two minutes. In that time, use the included brush to gently loosen any stubborn dirt in crevices of your Onefooter. Then rinse your piece under running water, and dry it. After that, it’s time for a touch-up polish with the polishing cloth. Alternatively, our cloths can of course also be used alone. They are perfect for travel. So there you go: you are all set for always shiny, always fresh bling! I am so happy to finally give you this solution – literally. You can order these on my website here. And I will bring them to Vancouver with me when I come again for the CircleCraft Market (I’ll be in booth No G11). *Have I mentioned what great stocking stuffers these will make?